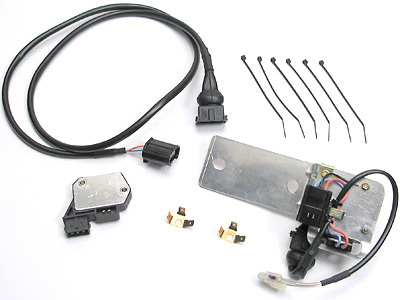 This ignition amplifier module relocation kit for Land Rovers and Range Rover is designed to move the ignition module from the side of the distributor to the left fender well. It will be mounted under the ignition coil using the existing mounting bolts. This will allow the module to operate in an environment with lower temperatures and less electrical interference. 1. Align the ignition timing marks on top dead centre making sure it is for number one cylinder. 2. Remove the distributor and replace the ignition module with the dummy module which is supplied in the kit. Ensure the terminals in the blue connector are tight and plugged onto the pins in the dummy. 3. Replace the distributor making sure the rotor is aligned to number one cylinder. 4. Install the heat sink bracket with new amplifier under the ignition coil using existing bolts. Make sure the braided ground wire from the engine block is there and is clean. 5. Using the supplied harness, plug the matching end into the dummy module and into the matching connector on the heat sink/amplifier. Secure this harness to the existing engine harness. Cable-clip/tie the original distributor connector out of the way. 6. On the negative side of the coil, remove the black/white wire. Cable tie it out of the way. It is no longer used. Retain the PVC covered wire that runs into the engine harness near the mass air flow meter. Install the white/black coming from the new amplifier harness to the negative side of the coil. You may have to change the connector. 7. The remaining white wire will be installed to the positive side of the coil. Make sure you retain the existing white wire. 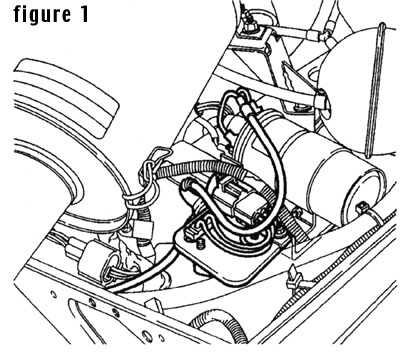 (This is the power feed from the ignition switch) You may have to change the connector. See figure 1. 8. Start engine and adjust timing to original spec.